SITE Intelligence Group says that a suspected militant group called Ansar al-Islam has claimed the responsibility for the murder of secular activist Nazimuddin Samad. 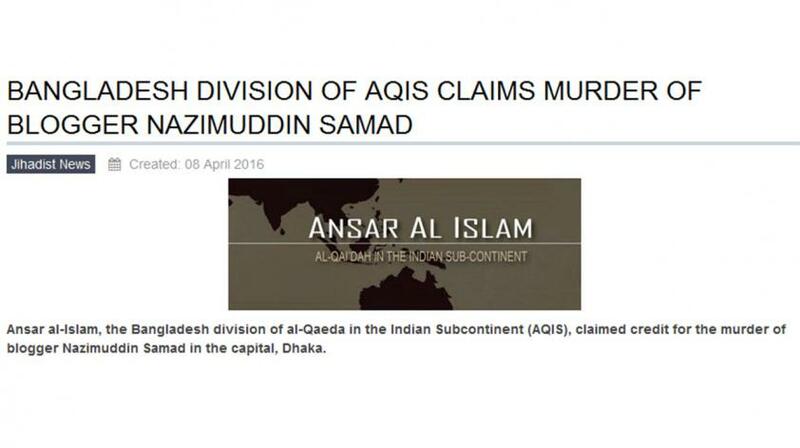 Two days into the killing, SITE, the US-based online tracker of terrorist organisations repots today that Ansar al-Islam, the Bangladesh division of al-Qaeda in the Indian Subcontinent (AQIS), claimed credit for the murder of blogger Nazimuddin Samad in the capital, Dhaka. Unidentified assailants hacked and shot Nazim, 26, a law student of Jagannath University, to death in the capital's Hrishikesh Das Lane Tuesday night.